Fish might not be the first thing that comes to mind as a roast dinner option, but this salmon dish is quick to make and incredibly tasty. It goes perfectly with roast or steamed vegetables and sweet or white potatoes. 1. Place the salmon in a large baking dish and season with the tarragon, marjoram and/or thyme and a pinch of salt and pepper. 2. Mix the garlic, orange zest and juice, honey, olive oil and ginger together in a small bowl. Pour this on top of the salmon fillets and allow to marinate for 1 hour. Turn the salmon at least twice during this time in order to coat the salmon well with the marinade. 3. Preheat the oven to 200°C/gas mark 6. 4. 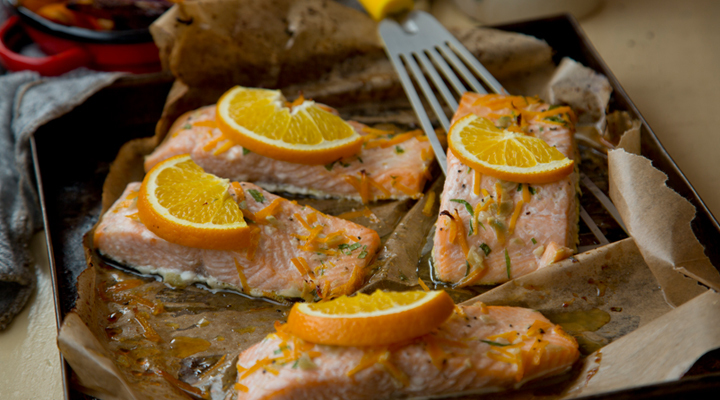 Top each fillet with an orange slice, then place the dish in the oven and bake for 20 to 25 minutes, until the salmon is cooked through. Garnish with the chopped fresh parsley. Tip: Always cook your salmon fillet with the skin on, as leaving the skin intact helps the fillet hold together.